Senior defense officials say that Hamas has arrested the terrorists responsible for a mortar attack on the Eshkol region. 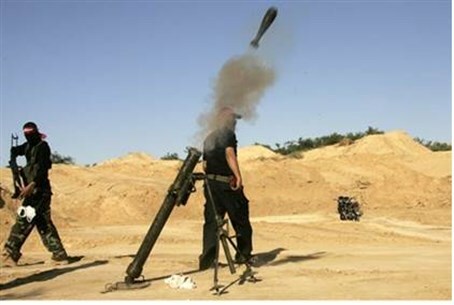 Senior defense officials said on Tuesday night that Hamas has arrested the terrorists who were responsible for the mortar fire on the Eshkol region earlier in the evening. According to the officials, Hamas had passed a message to Israel after the shooting that it would arrest and punish those responsible for the shooting, and did just that. One official quoted by Channel 2 News said that Hamas was quick to react and arrest the terrorists, fearing that the fighting in Gaza would resume. The officials further noted that Israel has made it clear to Hamas that it will be judged by its actions "and that if measures aren’t taken against violators of the ceasefire we will have to act." The firing of the mortar shell from Gaza was the first such attack by Gaza terrorists since the ceasefire went into effect on August 26. Hamas had claimed earlier Tuesday night that it had nothing to do with the rocket attack, saying it remains committed to the ceasefire. Hamas breached numerous ceasefires during Operation Protective Edge, as well as over the course of recent years. "The Palestinian factions are committed to the truce," spokesman Sami Abu Zuhri said. "We want it to continue." The rocket also comes the same day that Israel reached an agreement with the UN and the Palestinian Authority (PA) to renew the entry of construction materials to Gaza under a mechanism preventing them from falling in terrorist hands. Hamas has in the past taken such materials to develop a vast network of terrorist tunnels to attack Israel. Reports have revealed that reconstruction on the terror tunnels has already begun.